Writing, like any form of creativity, is lonely; family and friends don’t understand what you are doing, progress can be slow and the often bizarre world of publishing is like navigating an alien landscape. Writer’s groups can be embarrassing; at worst cliquey and at best intimidating. The route to where you want your writing to go is invariably fog filled and you don’t have a map. And yet, you feel like you have to write. 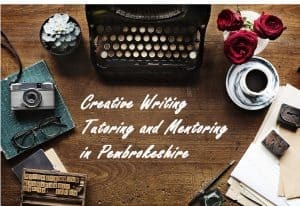 Through a combination of tutoring and mentoring I give writers in Pembrokeshire the opportunity to discuss their writing, receive impartial and encouraging feedback and educate themselves so their writing goals become clear and they develop a plan on how to achieve those goals. In non-judgemental one to one sessions we will cover what you need most – this service is totally client led. It may be you have nothing but an idea and need a starting point to work from or it may be that you have a polished manuscript and now want to know how to craft a query letter to a publisher or agent. Sessions are relaxed but focussed and a two hour session is recommended in the first instance. You don’t need to bring samples of your writing, you may prefer to email something beforehand or you may not yet feel comfortable about sharing your work, either way we will find a way forward together. And there will be cake and tea, lots of tea. I am an award-winning travel writer and a frequent contributor to online and print journals including Deeper Blue, the scuba website and New Welsh Review, Wales foremost literary magazine. I am the proud recipient of a Literature Wales Bursary for 2017 and I am hugely grateful for the support and recognition that Literature Wales gives the creative arts in our homeland. As a freelance writer working to a brief I have written everything from storylines for computer games to full-length manuscripts on business start-up. My personal style in creative nonfiction and literary fiction is rich in allusions and tends towards magical realism. I am represented by Broo Doherty, Director at DHH Literary Agency. Gramarye Writing Centre shared a post. Blade Runner was a great film - in all cuts - but Do Androids Dream of Electric Sheep was so complex and beautiful I'll remember it forever. I think I was 15 when the film came out and the sound and the cinematography blew me away, but it wasn't the same as the book, the book was still better. A classic by Zola, a housewife’s handbook on promiscuity, Toni Morrison’s Beloved – in Banned Books Week, a look back at works that have been subject to silencing or censorship.